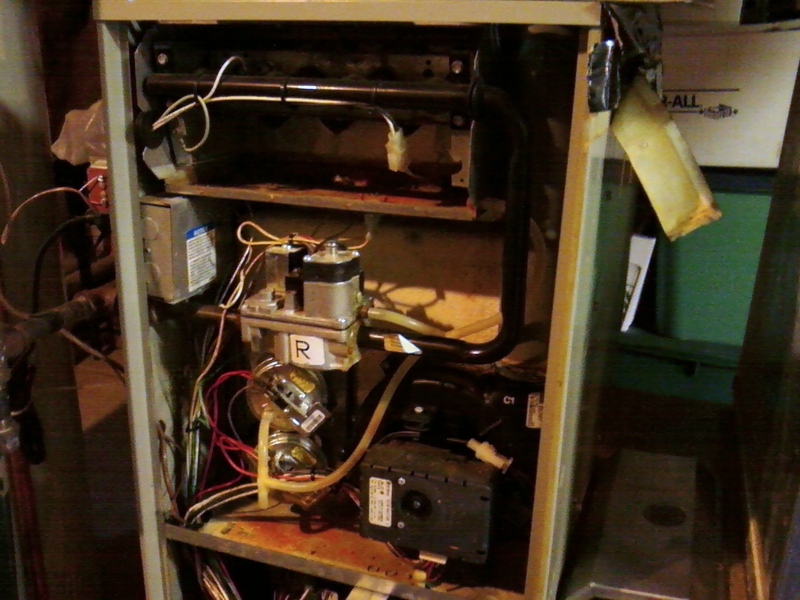 To recap what went on, this furnace had not been maintained in several years. 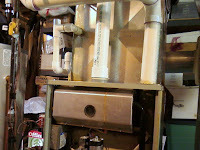 The drain trap to the air conditioner coil plugged and allowed water to pour all over the furnace, into the burner box, the pressure switch tubing and into the pressure switches themselves. 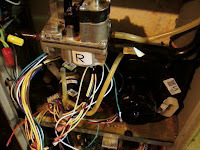 To add to the misery, it also got into the electronics and onto the inducer motor. This only corroded the board a bit, but could have put said motor out too. However I couldn't prove this, but I could prove the motor had failed. 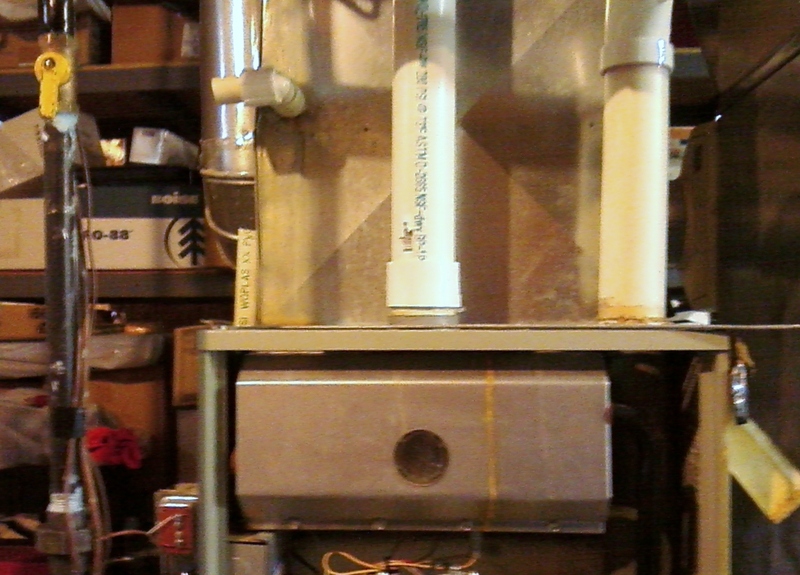 This is the furnace with the ECM inducer; the black rectangular beast in the lower right hand corner. They were very failure prone, especially if the cooling fins weren't cleaned regularly. If you still have one of these and it still works, get it serviced regularly. These motors are usually quiet when they run, but when they start whining, you need to plan for a replacement or be left with a no heat. Does this mean I'm a bad technician? Well, Trane in all its wisdom, subbed out what's called an ECM motor for their blower and inducer motor assemblies. They run on direct current or DC, which is supposed to use less electricity and be more reliable than comparable A/C units would be. This wasn't exclusive of Trane, but Carrier, Bryant and possibly others used this same system for the inducer on all their high end 90% furnaces. The only difference is that Trane abandoned this system and went with three-phase for their inducer motors on their variable speed furnaces. To my knowledge, Carrier and Bryant are still using the ECM which is supplied by G.E. and failures are still happening. The three phase inducer setup Trane now uses is practically bulletproof; I've changed only one in 5 years because the bearings locked up. With this upgrade in technology, Trane also made the ECM style obsolete. So now instead of replacing the inducer, which was a ten minute job and still cost the customer close to $600, the entire wiring harness, control board and inducer has to be upgraded to the new style. All this is to the tune of over $800 and at least an hour's worth of work if all goes well. This one didn't because the person who installed it didn't properly adjust the manifold for high and low fire. The lack of maintenance sure didn't help either. The new drain trap is now installed on the A/C coil, note the clean out tee. I also left a couple joints unglued to facilitate cleaning of the trap. Here's the new wiring and three phase inducer motor installed; note the wiring is not completely hooked up or tied back. After nearly three hours of finagling with this beast, including the gas pressure and wiring, it ran nearly as good as new. I replaced the ignitor, because the old one was over limits. I also cleaned the flame sensor, checked the burners and cleaned all the drains. In addition I also checked the gas fireplace out because the customer indicated the remote control wasn't working right. I confirmed it wasn't after another half hour of messing with it. The total bill for this call, including trip, diagnostic, installation of a KIT 15017, two pressure switches, hot surface ignitor and a drain trap came to $1153 and some change. This was about $350 more than my Miller for my mobile home cash and carry cost and would have nearly paid for it installed. It took me five hours to install the Miller and three to fix the Trane. However, it would have run over three grand to replace this with a Goodman (well over that, I might add). 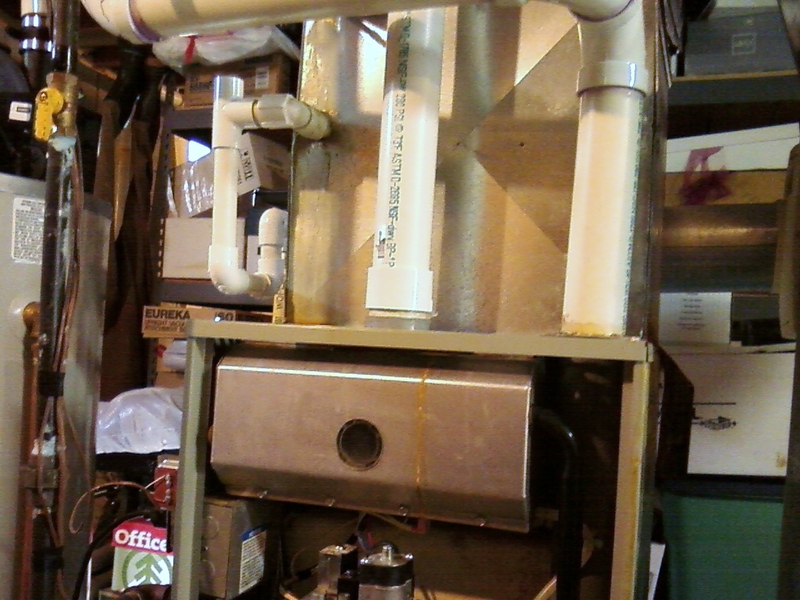 Lesson learned: Condensing furnaces (90%+) need annual maintenance and so do air-conditioners of any efficiency. Even though the bill was expensive, this could have been much, much worse. If this had been on a first floor, or in an attic the consequences could have been disastrous. Damage to walls, ceilings, floors and furnishings could have run into the tens of thousands; not to mention the health hazards of mold and mildew. Any way you look at it, maintenance on your HVAC equipment needs to happen. This customer took to putting a reminder on her smart phone so hopefully this won't happen again. Maranatha! The KIT alone for this this fix at retail, is over 600 dollars PLUS shipping retail. If you're handy, you can do this yourself, but there are a lot more variables than just replacing a part and a few wires. Adjustments frequently have to be made and the reason why the parts have failed needs to be found and fixed. Parts don't "just fail" without a reason unless they're defective. With modern quality control methods such as Six Sigma, etc. these are becoming less common.